A four-alarm fire burns at a storage unit facility in San Jose (August 28, 2016). 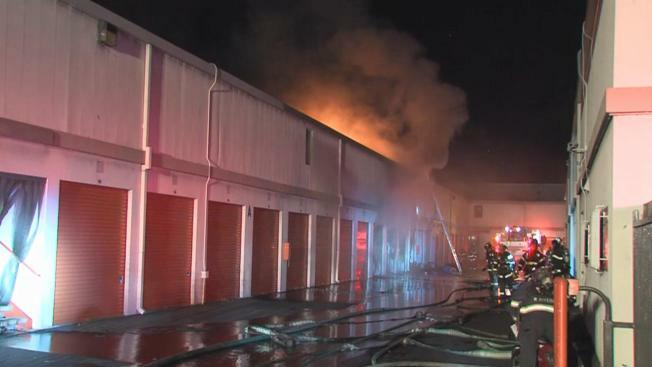 Firefighters are have brought a four-alarm fire under control that was burning at a public storage center in San Jose late Saturday night, fire officials said. According to fire officials, 60 firefighters and command staff worked to extinguish the blaze, which was knocked down around 3:30 a.m. Smoke in a single storage unit was first reported at 9:06 p.m. at the Public Storage center at 925 Felipe Ave., Capt. Mike Van Elgort said. The first firefighters to arrive found a fire that had extended into the second floor of the facility and nearby units. There were no injuries, nor evacuations reported, and fire investigators are still on scene working to determine the cause. Roughly three years ago, a three-alarm fire ripped its way through the same Public Storage facility.